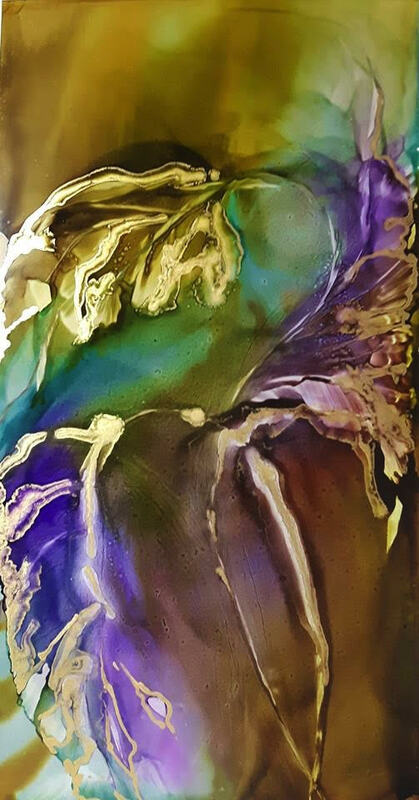 As ink demonstrates a beautiful fluidity on yupo paper, Michelle has chosen to honour her inner intuitive compass and create vibrant collections of ink paintings – most notably, an abstract, impressionistic underwater series, an autumnal Ontario series and stunning florals. Michelle’s creative impulses have led her to use unconventional tools to manipulate the inks, such as various blending solutions, bits of plastic, tubing and different kinds of compressed air. Michelle Hudson moved to Ontario in 2011 from Alberta. Early on, Michelle did some designing of commercial illustrations and her works reflects her time working in the forestry sector and by the Canadian natural landscapes. She enjoys the organic process of intuitive painting with inks and creating scapes rich with colour, vibrancy and imagination. Michelle proudly donated a portion of her sales from her most recent Patrick House Art Studio & Gallery solo show to the Heart and Stroke Foundation of Canada and for the past few years has donated select pieces to the SickKids Foundation. She has most recently donated a selected piece to Southlake Foundation Auction 2017.